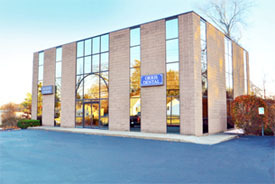 The suburban office parks as we know it might become a thing of the past like the VCR and home answering machine. As more corporations flock to cities, they are vacating these office parks, many of which were built in the 1980s…But some of these parks are not staying empty. 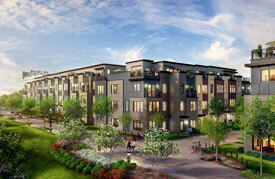 An increasing number of developers are converting them into housing, according to a recent Washington Post report. A 2016 report by NGKF looked at office parks in five suburbs, and found that between 14% and 22% were “in some stage of obsolescence” (i.e. high vacancy rates, too much or not enough parking, the space needs substantial renovations). That suggests that up to 1 billion square feet of office space — or 7.5% of the country’s entire office inventory — is becoming obsolete for the people who work there. The town of Newton recently opened its doors to welcome the New England Israeli Business Council along with Governor Patrick, who had brought the council here to Newton. Governor Patrick, along with the Israel Business Council and many members of the Newton business community attended an invite-only event to share what Boston’s Suburban innovation district, the N2 corridor, has to offer. With large companies such as CyberArck who have rooted their corporate offices in the heart of the N2 corridor in Newton, trust this move to be both critical and beneficial for their corporations. 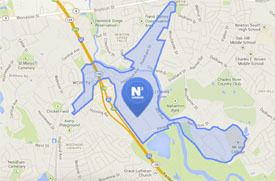 The Newton/Needham area boasts convenience, lifestyle and most importantly, talent. David Goodtree, a co-host of the event last week who represented the New England Israel Business Council, stated in Boston Magazine “businesses also want to be close to other talents, whether it’s engineers or sales people, or even other executives. They need more office space, and more affordable office space…that’s where the appeal of the N2 Corridor space comes in”, Goodtree argued. “It’s a prime destination for growth stage companies”. Additional information on the N2 Corridor is available on the Boston Magazine. Moving out to the burbs, who would have thought? With innovation and technology booming in the greater Boston area, Boston proper is running out of space. With arms wide open, the suburban market place is gearing up and ready to accommodate. Posh areas have revitalized their sleepy town centers and have agreed that designating suburban land for commercial space must be done in order to utilize the real estate properly. There is a need for housing, there is a need for social adventure, and there is s definite need for space! Northland Investment Corporations undertook this project as they saw the pressing needs and desires. Back in August, the Town of Waltham underwent a huge makeover, from its quiet town center now being primed to focus on luring the full lifestyle package changing the stereotype of the lethargic 1950’s old school, soda pop Main Street into a modern, young and vibrant center. When the development of Marc at Moody and Main began many questioned the intent, but this is a great way to bring flair and affordability, convenience, and energy into the region. Situated just 7 miles from the heart of Boston with some of the best transportation in the country, is a plus. A true live, work, play environment has been achieved. With more and more influence and expansion the burbs are not heading back to sleep. The greater Boston economy is strong with jobs, construction and capital. Many office users are seeking value while trying to straddle the live-work-play model for their staff. Not every company can be located within a five-minute walk of South Station, nor can they offer free parking to their employees. What we are seeing is locations that offer infrastructure, reap the benefits of today’s strong office market. Jump over to the Globe’s website for its full article. 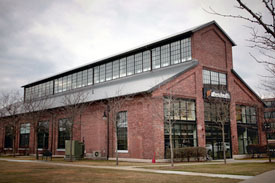 Athenahealth is planning to re-invigorate the historic Watertown arsenal and the area with the addition of restaurants, retail stores and an internal expansion. In the process, they also seek to create an 1,800-car garage on the west end of the campus. With the addition of amenities, downtown Tenants will be attracted to the area due to its cost effectiveness, accessibility to Boston and public transportation as well as the ability to provide parking for employees. This should have a positive overall impact on businesses moving to the area and office space in surrounding markets such as Needham and Newton. The Town of Needham is experiencing a boom in development. 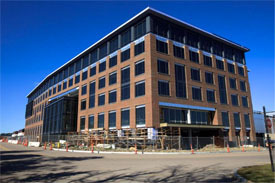 With an abundance of newly-constructed office buildings in Needham, recent zoning changes as well as the state’s add-a-lane highway project –- which will include on- and off-ramps for Route 128 at Kendrick Street -– Jeremy Freid, a partner in the suburban arm of Boston Realty Advisors, believes said change will send positive signals to the business community.